An award winner several years running this excellent amplifier is a budget champion that will get the best sound from your bookshelf or floorstanding speakers. 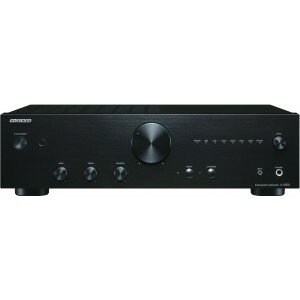 Onkyo A9010 is an award winning integrated stereo amplifier that provides exceptional sound quality for a very rational price. Tweaked in the UK, A9010 integrates adapted circuitries and four audio-grade capacitors explicitly aimed at conveying warm full-bodied sound. Featuring a large transformer, distinctive high-current low impedance circuitry and a discrete output stage, the amplifier allows precise control of the speaker drivers with minimal distortion. A dense extruded aluminum heat sink maintains a cool operating temperature. On top of this, the Onkyo A9010 incorporates a MM phono equalizer, individual headphone amp and gold-plated speaker posts. The dense knobs offer ease of control for volume, tone and input selection which reflects the high-quality engineering within and adds an appealing vintage charm. We've heard the A9010 with a range of speakers and is generally very unfussy about speaker matching, sounding fantastic with a range of bookshelf speakers and floorstanders. We've even put together some of our favourite combinations as A9010 speaker package deals. I give this 5 stars purely for its value for money. I bought this amp as temporary replacement for a high end amp that failed and is being repaired over coming weeks. The Onkyo has 4 line inputs and one MM phono input with earthing terminal. Pair loudspeaker connectors, an Audio out (but no tape monitor sockets) One front panel there is a 3.5mm input for portable players output. Headphone socket, and usual controls for Volume, bass, treble, balance, Bypass on/off and Loudness on/off. Sound quality is lively and dynamic, and sufficient volume to drive bookshelf or floor standing speakers. Advancing volume to high levels the sound does thin a bit, and lower frequencies /bass do lack the weight and "grunt" of more powerful integrated amps. Generally very good sound and good value. My only criticism (and minor considering its price) would be that the speaker terminals on back panel and not very robust (bare wire or banana plugs) and flex with the weight of heavy cable! Also the volume control has no markings and its own marker is almost impossible to see, so its difficult to know how far the volume has been advanced, and it does have a section with the volume increases a lot with a small advance and tricky get the level just right even with the supplied remote control. Apart from those minor niggles, this is a great little amp, and good service as always from Audio Affair. I just bought this amplifier to replace my Yamaha AS500 that for some reason died without a warning (the left channel stopped working and couldn't be repaired), then I was searching on the web for some affordable amp that could make all my heavy metal/heavy blues CDs, MDs and audio cassette tapes sound great with good bass punch and clear treble; then after thinking what to get I was trapped trying to choose a good amp with these 3 options .......Yamaha AS 501, Marantz PM 6005 and Onkyo A 9010 ........I think I have chosen the best option of the three; ..not that the other 2 amps, Yamaha and Marantz do not deserve recognition but this Onkyo A 9010 was built to blast the walls with rock and roll; I was really impressed and surprised how a cheap amp with not digital connections or modern gadgets (optical input and coaxial input) could deliver such a good, powerful, dynamic, clear and detailed sound from the 3 sources I use; CD, MD and AUDIO CASSETTE TAPES........ songs like IN A GADDA DA VIDA (Iron Butterfly), BREAK SONG(Vanilla Fudge), BORN TO BE WILD(Steppenwolf) sound so explosive, full of dynamic energy and how DEEP PURPLE'S smoke in the water song can be so high and solid when you play it using this ONKYIO A9010 amp; I used just 1/4 of the volume and believe me it almost blasted the walls with the sound of pure thunder coming from my speakers.........I believe I have made a wonderful and right choice .....I couldn't be happier with this amp........it was built to rock and roll.